ASIS Futsal Tournament held on June 28, 2014. 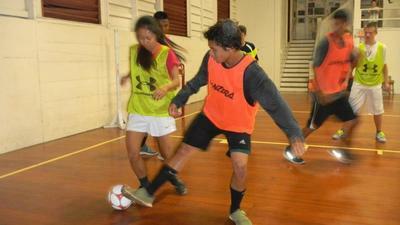 Futsal is the latest sport featured in the All Saints' Indoor Sports program. Participation is free and open to all high school youth and young adults (or daring middle schoolers). Game is played through informal scrimmages (no referees) and small goals (no goalies). It's a great way to sharpen your ball handling skills and stay in shape between soccer seasons! "Like" our All Saints' Indoor Sports Facebook page to stay informed about futsal and other sports programs in the all Saints' Gym. For more information, e-mail or call 651-7773. 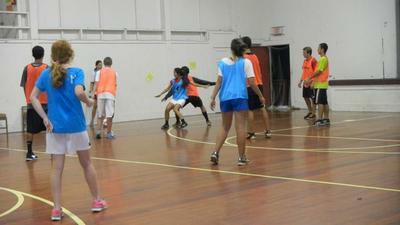 Pictured above is action from one of the latest futsal sessions in February 2014. Please note that scrimmages are not scheduled at the moment. Stay tuned on Facebook for the latest updates. Below, players wait their turn and take a break outside the gym.